Roomy seating for seven still allows plenty of storage space for cargo. Fold down the rear seats using the handy electric functions to create up to 83 cubic feet of space. The front row has heated and cooled bucket seating with a centrally located utility console to stow extra gear. The instrument panel keeps everything right at the driver's fingertips, from the inset touchscreen to the range of controls mounted directly on the steering wheel. 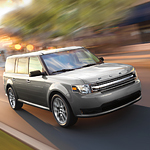 Test drive the Ford Flex when you stop by Lithia Ford of Klamath Falls. We've got an extensive range to choose from and will be available to answer any questions you may have about the Flex's many features.